Color Remover: Do not fall in color flood! 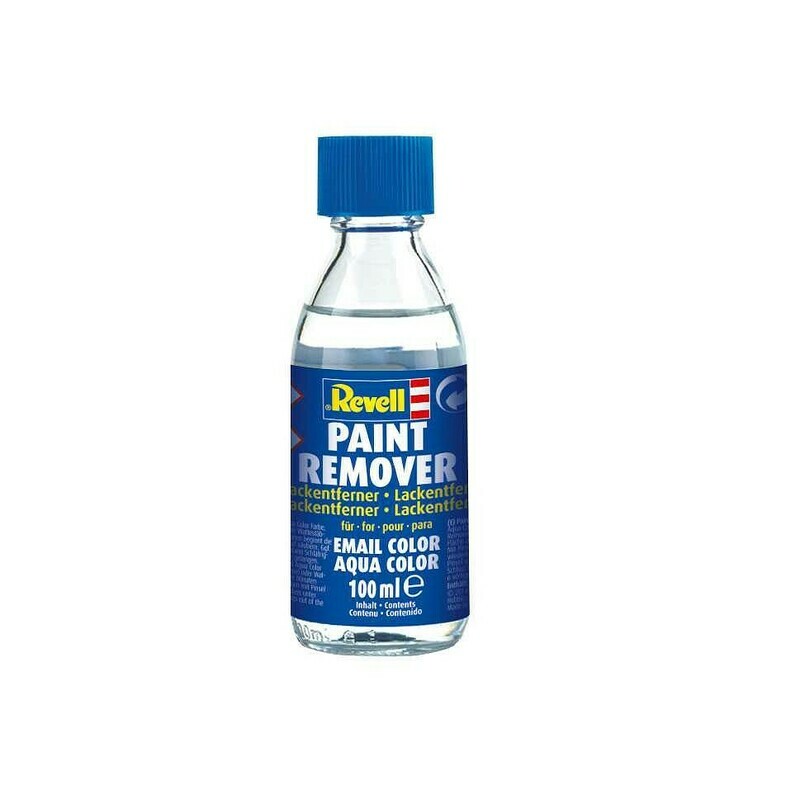 With the Revell paint remover, modellers can now remove even a completely dry paint from their models. This means that no varnish error is permanent and can be easily rectified before completing the model. But of course already finished models can get a completely new paint. Due to its special composition, this remover can remove Revell Email and Aqua Color without damaging the plastic surface of the model. Even after its use, even the finest engraved elements remain, and transparent portions such as cockpit covers are as transparent as if they never touched the remover. The use of the remover is very simple: apply the undiluted remover using a brush or cotton swab to the desired spot from which you want to remove the paint. Its effect is evident in just a few minutes. It penetrates all layers of paint, including Revell undercoats, which can be reliably removed from the model. During the whole process a characteristic film is formed from the original paint. After that, the diluted paint is easy to remove, for example, with a brush. In case of necessity, especially for thick layers of paint, the whole process can be repeated for the perfect result. Before you go into re-painting, the part from which the paint has been removed is finally to be cleaned under running water. Apply Paint Remover with a brush or cotton ball undiluted on the treated surface. After a few minutes the color begins to separate. Remove brushes, etc. Apply repeatedly. Finally, wash under running water. Contains: 1-Methoxypropan-2-ol, n-Butyl acetate. Flammable liquid and vapors. May cause drowsiness or dizziness. If medical assistance is required, keep the packaging or product label at your fingertips." Keep out of the reach of children. Read the label information before use. Use only outdoors or in well-ventilated areas. Protect from heat / sparks / open flame / hot surfaces. - No smoking. Store locked. This product is not a toy. Caution! This product is not a toy.